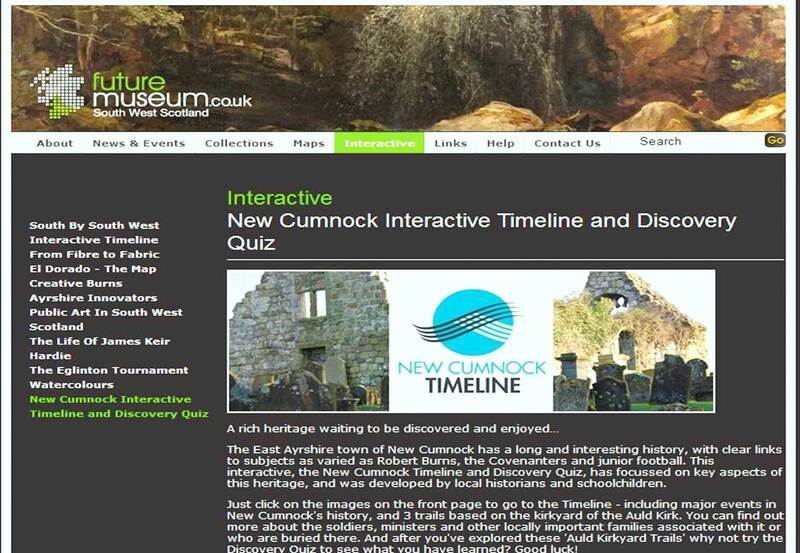 We are delighted to announce that the New Cumnock Interactive and Discovery Quiz is now live on Future Museum a partnership between East Ayrshire Council, Dumfries and Galloway Council, North Ayrshire Council, South Ayrshire Council and the independent museums of the south-west of Scotland. Just click on New Cumnock Timeline on the front page to go to the Timeline – including major events in New Cumnock’s history, and 3 trails based on the kirkyard of the Auld Kirk. You can find out more about the soldiers, ministers and other locally important families associated with it or who are buried there. And after you’ve explored these ‘Auld Kirkyard Trails’ why not click on the Discovery Quiz to see what you have learned? Good luck! Please note the Timeline is best viewed on Full Screen mode. This entry was posted in New Cumnock. Bookmark the permalink.